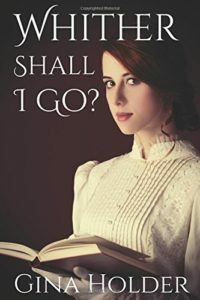 Tag Archive | Whither Shall I Go? Whither Shall I Go? by Gina Holder is a wonderful Christian historical romance. It spans the years from 1911 to a few years after the end of the first World War. The reader crosses from the American countryside to New York City to France and to the jungles of Brazil. From log cabin to expensive town house to the trenches to native villages, the reader is in for a real treat as Gina Holder’s descriptions bring the novel to life. God is at the heart, as characters seek Him and try to do His will. “Trust God and take a risk.” Following God is not always easy but it is always rewarding.